Hey Briar Folk. Since Friday I have been having an issue where the paper I am trying to print on seemed to be bouncing in the press and the registration (I am using guides) was way off. I thought it might be a side guide issue, which I am not 100% sure I know how to adjust. I called a mechanic this morning who has somehow made my issue worse. Here’s the link to the video I shot. Hiya. Good job on the video. You might want to remove the brass gauge sitting between the rightmost brass gauge and the swing-gauge… two are all you need and the swing gauge is not precisely the same height as the brass, IIRC. Some tilting may be occurring by having two brass gauges so close. They remove easily by tilting (see the manual). Do not be alarmed that the sheet is in a different location at delivery: the gauges lift and slide the sheet to the right, after the gripper opens before impression, the gripper then grabs the sheet in the new spot. I would check the stop in the groove under the feed-table that says “Nickle gauges —->, Brass Gauges <—-. It should be set for brass and the pile should be close to the left edge of the front standard (has the blast holes and fingers). It could be the sheet is falling and bouncing when the gripper opens just before impression. The closer the sheet is to the end of the gripper, the less distance it falls to the guides. You can make a closer inspection by stopping the press just after pickup (as in the video), then turn off the motor. Advance the press by hand (clutch engaged) and watch the paper drop, lift and move. Look for any erratic actions. Didn’t see the swing away gauge at first. As suggested try removing the brass lay gauge in the middle and make sure the swing gauge matches your sheet size. Also ensure the knurled knob is latched on the lower laybar linkage. You have a brass guide on the right most side of the lay bar that should NEVER be out there, it can shift to the right and damage the press. make sure that your feed board is square to start with if the problem persists then check by running the press very slowly up to the closing point and see if the sheet is hopping over the pins on your lay gauges ,you must have a pin on the left hand gauge ,you will rarely require one on the right side ,in fact a pair of original brass lays only allows pins in one guage. the difference in gripmargin between feed and delivery is of no consequence as this will vary dependant on the position of the side lay ,ie Fully in or fully out , you should always try to set the press with side lay set in the centre of its adjusment and never fuly in or out ,either position sets its own grief. On closer inspection of the video, it is hard to tell if the lower bar is coming up… the silver knurled knob for the lower lay bar (by the flywheel) needs to be latched. Okay. So, what I found out before I left the shop is the bottom guide bar is not rising up all the way like it is supposed to. I have the knob pin engaged in the hole, the screw near the grippers is set to “with gauges” and I have the feeding tray pushed to the left for brass gauges. If I run the press slow, I can see the gripper take the paper into the platen, the bottom guide bar rises halfway (does not make contact with the spring lever on the swing gauge.) The paper drops too low, the gets picked back up by the gripper in the wrong position like the video showed. Has anyone have any knowledge of what to do if the bottom guide bar seems stuck, coming up only halfway? (I’ve run the press for a year with all the settings as is and no problem with the gauge positioning.) I do move just the swing gauge depending on paper size. I generally agree on the rightmost gauge, but users may observe that the manual regularly illustrates gauges out that way. Occasionally, the silver knob will appear latched, but not really. The knob rotates and has a slot that accepts a pin that faces away from the flywheel. It might take a bit of wigglin and jigglin to get the silver knob to totally latch. I’m pretty sure it was in……but hopefully I’m wrong and you’re correct. I’ll wiggle it tomorrow morning I see if that helps. Thanks everyone. Whilst the manual shows the guide out on the right it is still one of the most common smashes , a bad sheet can knock the guide further right and it always ends in a bad repair bill especially where very old well used guides have very slack springing on them , however I do it myself but for the instance of the folks that are not even aware of what a weak fit feels like it is best avoided in my opinion . The engage knob should just twist to lock the kknob/handle or whatever is best description has a locating tongue protruding from its underside ,you can usually feel it locate when you twist it. I figured out the problem this morning. The bottom guide bar was sticking and stuck. I manually forced it up with the pin on the knob disengaged. I heard a pop and the bar was able to freely rise all the way up. (Apparently something inside was blocking it from fully lifting.) After that, I engaged the pin with the knob and the bottom guide bar now works perfectly. Guess sometimes the old press just needs to be man-handled. I have a similar problem. My guide bar isn’t consistently coming up into place. It usually doesn’t come all the way up when engaged which is causing tons of register issues. It gets stuck about halfway up and so the paper never makes it down correctly. I’ve oiled all the points along the entire mechanism a lot hoping it’s just a friction issue and also tried to work it back and forth while disengaged just to see if I can understand why and where it keeps sticking but nothing seems to work. had the same issue a few years ago, I oiled it like crazy but finally found out that the problem was behind the flywheel, after oiling back there I’ve never had problems since. 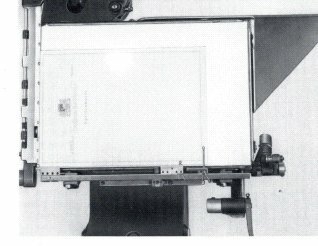 If it binds, the problem is somewhere on the portion connected to the platen. If not, it is likely something in the linkage from the cam. So I think I found the problem. It’s my bearing bracket. The previous owner had shimmed it with some wood and steel reglets. I removed them thinking it would help but that seemed to make it worse. Now it only comes up like 2/5’s of the way and can’t even force it the rest of the way like before. So clearly something is wrong with that part or the bar it connects to. Not sure which is the main culprit. I think I might need a mechanic to help replace that mechanism. It’s possible the wood has compressed enough over time to misalign the bracket. I’d put the shims back and add paper or mylar as needed to see if the sweet spot can be found. That could be much easier than replacement of the spindle, and just as effective. I’d love to get the shims back in there but I don’t seem to be able to get the bracket to open enough to stick anything in. It’s extremely tight. I tried to get a screw driver in there and pull it back but it didn’t seem to want to budge. Any thoughts on a tool that can pry it open in order to get some shims in there? 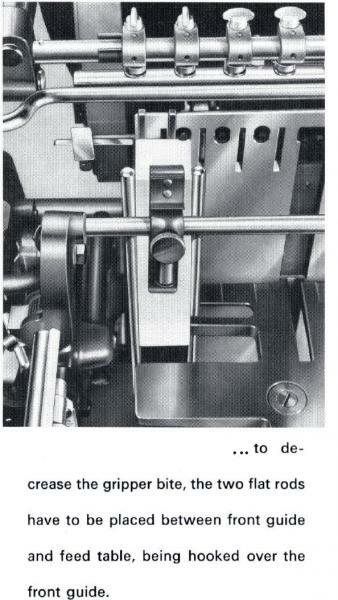 Hopefully we are discussing the same part… I’m referring to the bracket very close to the knurled chrome knob. (I don’t have the part#). I managed to get the bracket opened with a pry bar via the bolt holes once I removed the bolts. I found the sweet spot for the shaft that had the least amount of resistance and added some metal reglets to shim the bracket. The guides appear to be coming all the way up now. Only problem is I’m still having register issues. I can’t tell if the guides are still at fault or if there is something else happening. It’s not every other sheet or anything like that. 6 out of 10 will be good and then the next ten will only have 3 that are good. The paper appears to be skewed when impression hits. Usually only by 2-4 points but less often will skew up to 10 or more points. I thought it might be static which is why I totally changed my packing. Then I thought it might be bouncing so I’ve adjusted the left feeding table guide to various positions. I can’t seem to find the cause. The paper I’m feeding is Lettra 110# and I have my form set all the way in the lower right hand corner of the chase. My packing is tympan paper, red pressboard, some hard packing I just got from NA Graphics. The gripper bars are parallel with the feeding table and packing as best I can tell. I don’t know how to test the feeding table’s straightness but I’m relying on the bar that points to a parallel setting. I’ll try to get some video posted tomorrow. Thanks everyone for all the help thus far. It looks like my problem is actually the paper is not sliding all the way down into the right guide. I took some pics to help illustrate since in the video it’s kind of difficult to see what’s going on. Are my gripper bars too close to the platen? I’ve pulled the bars out a bit to make sure they were parallel. They seem to be parallel now as they cross the packing. Should I pull up on them even more? I also checked their feed points with a pencil multiple times and they seem to be grabbing the paper in the same spot each time and parallel across the paper. Also, regardless of which gripper bar picks up the paper the same problem exists. Is it electrostatic? I’ve tried a few things to get rid of static but I’m not sure what the best way to do that is or if it’s even an issue. I’ve read things like rubbing down the tympan with a dryer sheet and wiping the paper edges as well. Tried both of those. I don’t have any copper mesh, should I get some of that? The pics look like the end of the gripper is quite close. With the press turned off, I’d reach in at that point to wiggle the sheet and see if that’s where it’s binding. But, I would not bend the gripper… I’d put a very thin shim of paper or aluminum under the gripper where the screws hold it to the gripper carrier. The shim would go furthest away from the center of the carrier. Thank you AnonyMouse, I’ll try that and see if it helps. Take all your packing off, advance the press by hand and check the space between the gripper and the platen from end to end. Sounds like it’s not dropping the sheet into position because there’s not enough room. Don’t be shy to bend the grippers up a bit. Some will advise against it. As long as the gripper doesn’t move when it opens you’ll be fine. I haven’t shimmed the grippers yet but I did totally redo my packing. And after more detective work it appears that the side lay gauge is the primary culprit. The paper is getting stuck up on it. I tried running it with the side lay gauge all the way out, all the way in, and somewhere in the middle (multiple places in the middle). I tried to add a bit of “lube” (facial oils) to make the paper slip but that didn’t help. I noticed it seemed to have some pits in it so I tried to sand it and that hasn’t helped either; possibly even made it worse. I pulled it all the way out and ran without the side lay gauge and the paper hit register and fell into the lay gauges nearly perfectly. Of course the gripper edge register that is helped by the side lay gauge was inconsistent but that’s to be expected when the gauge is off. So my question now is how can this be fixed? Do I simply need a new side lay gauge? Can it be machined or sanded appropriately to be useful again? What are my options here? How much “bite” do the grippers get on the stock? This can be measured by stopping the press just after pickup and tracing a line across the edge of the gripper while the paper is clamped in the jaws. The bite should be even across the sheet. The front feed standard angle adjustment is used to optimise the angle. The depth of bite can be reduced by using the cheater bars that clip onto the front standard and set the pile slightly away from the standard. Good for testing, but maybe a band-aid if needed for all stock. I’d check the front standard to ensure it is not loose, and has no debris under it causing misalignment. I’ve tested the “bite” of the gripper bars many times and did so again yesterday. It’s a little over 3/16” or 14 points. It’s consistent and mostly even save for a slight variation of 1 point here and there. Sometimes one margin might be 13 points or 15 points but it’s consistently around 14 points with only 1 point of variation at a time. I’m not sure what the appropriate “bite” should be or how consistent it should be so I don’t know if that’s bad or good. I can post pics of the grip marks I made on the paper if anyone thinks that would help. Just let me know. I’ve never heard of cheater bars. Can you elaborate please? Is it just a piece of metal to shim the paper back a bit so the grippers grab less paper? The front standard seems solid and clear of debris. I don’t know how to test its alignment but the bar near the impression lever points to the middle meaning parallel. So there’s that. If the bite is consistent long the paper edge, the front feed standard alignment is fine. That is a lot of shim. If that much is needed, some serious misalignment is afoot… possibly from a previous major collision or very poor lubrication practice. The main thing, is for that spindle to turn with no resistance and to slide right with only the resistance of the return spring, and it should snap back freely. It could be the guides are moving rightward early. Behind the platen there is an adjustment for the aforementioned part between the oil-tube and the small roller on the sidelay cam. It looks like a ramp. A small amount of rotation of the ramp toward the operator will delay the guides moving rightward, to allow the sidelay to be in position before the paper is pushed up against it. There is a bolt on the side of the platen holding the ramp in position, loosen to adjust and retighten before operation. First off, thank you for the advice, I will see what I can fiddle with in regards to that ramp and report back. I know, a lot of shim, right?! I was very inexperienced when I bought the press so I had no idea the guide assembly was bad since it fed paper and appeared to operate normally in the shop. The good news is I’ve finally got it moving better than it was when I started using the guides. I’m not sure what happened in the past but I know my guide assembly needs replacing (bent shaft possibly) but the cost is nearly equal to a whole press so I’m trying my luck with other options first. Luckily the bottom guides are being consistent at this point. With the side lay removed it hits register on the bottom guide side so that’s at least working well now. From the first time we started using guides we’ve always had an issue with skewed prints and after a lot of trial and error are we only now starting to realize it might have been the side lay this entire time. One thing to note is that the guide assembly tends to have a small bit of right side movement left in it by the time the platen closes since I’ve noticed I can push the knurled knob and the assembly will move a small amount to the right. So it’s possible they aren’t moving right at all and therefore contributing to the problem. I haven’t been able to fully confirm if that’s making a difference at this point though since I could be stopping the press too early or something. I’m still not sure of all those little details at this point. I have been religious about lubrication of the entire press and I lube the guide assembly components more frequently than recommended simply because it’s a finicky part I’ve been dealing with. So hopefully that’s helping. And by components I mean the entire mechanism from the stuff near the flywheel all the way across near the delivery table. Question: What is the recommended “bite” I should be getting from the grippers? Is 3/16 OK or is that too much? Should I use the cheaters regardless or will fixing the side lay be enough? Thanks again everyone for all the help. It’s been invaluable. So I tried moving that ramp and it didn’t work. Still had some skewed prints. I tried the ramp in various positions to ensure it wasn’t moved in the wrong direction. I moved it up and down. I removed the side lay gauge as well to ensure that the ramp hadn’t changed something else along the way. It did affect the bottom guides by a few points but when the side lay gauge was removed all prints hit register for the bottom guides (sometimes 54 points from the paper’s edge and sometimes 56 points depending on where the ramp was positioned). Of course, the side gauge was missing so there was some variation on that side of the page. 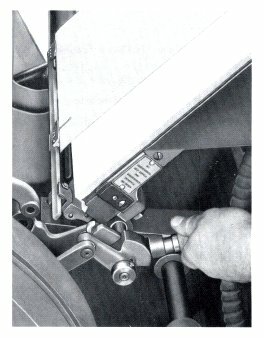 Anytime the side lay gauge was installed (regardless of ramp position or position of the side lay gauge itself) prints were skewed. It’s definitely interfering with the paper’s ability to drop into the bottom guides still. I’d probably run the ramp turned as far toward the operator as possible, to get the most delay in the movement to the right. I would try the cheaters, or a test that replicates cheaters by taping a couple reglets to the front standard. 3/16 is not that bad, but if you can get away with half of that, maybe you can miss the sidelay. The ramp was actually quite close to maximum delay when starting this latest process. After trying various positions I ended up placing it in the position farthest toward the operator in the hopes that it would contribute to the overall solution. OK, I’ll try some slug cheaters today and see what happens. If it works, would there be a more permanent fix to that issue? I’ve seen that thread and even checked that screw near the guide knob. I loosened the screw and tried to move things around but nothing budged and it didn’t seem to affect anything for my press. So I put it back and retightened it. Do you think there might be more there that I should be doing with that screw? So I found the cheater bars hiding in my tool box beneath the press. It’s nearly empty so I wasn’t going to bother looking there but I decided to check anyway. Lucky I did because they totally worked! Clearly the paper was just getting delivered too close to the slide lay and needed the extra space to fall into the guides properly. Prints are appearing to register now so I’m feeling a lot better at this point. However, there must be a more permanent solution to the cheater bars, right? What else can I do to adjust the press in regards to giving the paper to the grippers with less bite? Is there a way to move the feed table assembly forward a bit? Thanks again for all the help. I really appreciate everyone’s input.